This latest picture released from the Hubble Space Telescope is excellent for showing some of the features of galaxies we don't normally see. The galaxy is seen exactly edge on, so what is immediately apparent is the dark lane of dust and gas which runs along the galactic plane. The detail in this image is incredible, I've included a couple of close ups below to show the detail. 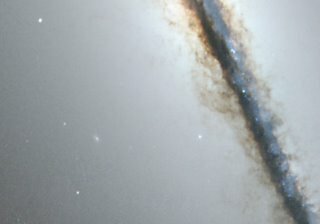 You can however go to the HubbleSite to explore a zoomable version. It's worth bearing in mind that although the dust lane appears dark because it is blocking and scattering the light of stars in it, the density of these clouds is actually very low. So low infact that on Earth we would call it a vacuum! It's only the vast distances involved that give the effect we see. 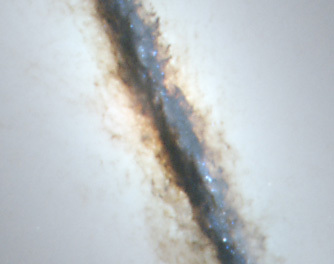 You can even see branches or tendrils of dust extending above and below the galactic plane. 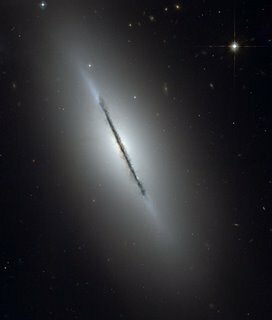 NGC 5866 is a S0 class of galaxy (according to the Hubble classification of galaxies), which means that it is a spiral galaxy without the 'spiral', more a flat disk with a bulge in the middle. A typical flying saucer shape. If you could see it from 'above' one of the poles you wouldn't see the distinctive spiral arms we see when we look at M31 Andromeda Galaxy or M51 Whirlpool Galaxy. The other feature worth nothing on this image are the globular clusters of stars which are distributed around the galaxy's halo rather than in the disk. These are clusters of perhaps a million or so stars which formed together. They can be seen to be quite distinct background galaxies which can be see through the halo. By studying the distribution of these globular clusters in our own milky way galaxy, Harlow Shapley was able to first determine the rough size and shape of our galaxy. Nice one Chris, excellent images and a nice summary.